A friend of mine recently announced they were expecting their fourth child, after the initial Yays, and Congratulations, they also announced that they had decided they needed to sell their home and move to a larger house to accommodate bub's arrival. Whilst pleased for them and their first announcement, I was dumbstruck at the timing of their second. It's as if one event at a time wasn't enough for them to deal with, they decided 'What the Hell, let's get twice as much stress just for giggles, sell and buy a house and have a new baby all at the same time!'. Lets face it, unless the property you are in is A) Falling down, B) Underwater, or C) On fire, moving house is never fun. As well as having to sell your property, you have to find a new one that ticks all the right boxes or it can be a very unhappy compromise. It's tiring, can put real strains on relationships, and can be very expensive. It's right up there on the list of most stressful things that people can encounter in their lives along with death and imprisonment! On a more serious note, a new baby, or family member having to move in with you can require a rethink of your current housing position. That lovely home you've made your own and raised your current family in can suddenly seem just too small when it comes to the arrival of a little one. A move to somewhere larger often seems like the only answer. If you're fortunate enough to own your own property however, it doesn't always have to be the case. There are other avenues to explore. One option is to build an extension. Now it may seem obvious with hindsight, but this is something my friend and her partner had not even thought about. Not only would it save them the hassle of selling up and finding somewhere else, it also means they would be adding to the value of their existing property. My own parents had an extension built to their home many years ago. Not only did it add an extra bedroom, but it also meant their kitchen doubled in size, they had a dedicated TV and games room, and that their property is now worth a lot more than a very similar, unmodified house across the road. This was not a huge extension, just merely making the most of the space available and the architect using the space wisely. An extension, like any work carried out on a property can have it's pitfalls. With professional help however, a lot of potential headaches can be removed before they even surface. 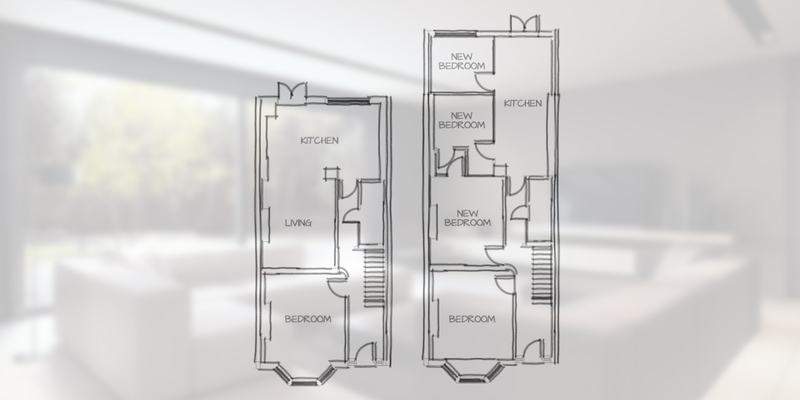 One of the biggest problems people often complain about is obtaining planning permission. Now, the ease of obtaining this can vary hugely depending on where you live, but again their are companies out there who can really ease the strain. It's worth doing your homework and researching who is available where you live before a final decision is made on how you want to proceed. Check reviews, discuss your needs and wishes with any potential company you may involve and carefully consider their advice. It really could save a lot of heartbreak and money in the future. Companies such as Ubanist Architecture for example, are dedicated to assisting home owners in obtaining planning permission for extensions. This, along with the many other services they, and similar companies, can provide often mean you won't spend many stressful hours pursuing the planning permission once a request has been submitted. Add the time spent doing this yourself to shopping for tenders from one tradesman to another-and simultaneously trying to get finances prepared for the project can be a logistical nightmare. If you're ever tried coordinating quotes from a builder, an architect, and other service installers whilst waiting for a response from your local council for planning permission you'll know just how frustrating this can become. Yes adding an extension can be a real alternative to moving, and can often work out considerably cheaper, quicker, and less stressful than selling a property whilst trying to find a new one. More importantly however, it can also unlock the potential in your existing home and provide more options of what you can do with your new space whilst adding value to it. When projects such as these are assisted by professional companies however, it may not be as difficult as you may have first imagined. My friend is due to have her baby in February, but now with a lovely new extension containing a nursery on the ground floor and new workspace above for her above, she's looking forward to it a lot more than she would have been had they decided to sell up and buy a new house. After all, lets face it, do any of us really need more hassle and stress in our lives than we already have? Have you ever had an extension built? A swimming pool installed or a loft conversion carried ? Do you have any sound advice, or funny stories, from having work carried out? If so, I'd love to read about it!